Plans for a viaduct to connect three Manchester railway stations have been submitted by Network Rail. The Ordsall Chord will link Piccadilly, Oxford Road and Victoria. [From Mark Bartlett] Network Rail said it would ease a 'rail bottleneck' south of Piccadilly and enable more trains to travel through Manchester city centre. The application to the Department for Transport follows an 18-month consultation. If approved, work could be completed by 2017. 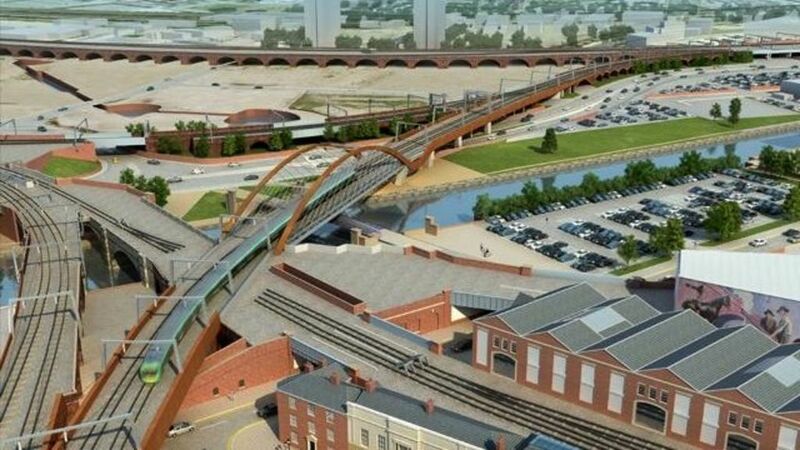 Plans for a viaduct to connect three Manchester railway stations are submitted by Network Rail. A map showing the location of the proposed Ordsall Chord. See news item. An artist's impression showing one of the proposals for the Ordsall Chord. See news item. 23/01/2007 Waverley Steps agreement means revamp edging closer. 01/07/2006 Gretna-Annan doubling: preparatory renewals work given go ahead.